Fractured Depth is an location in Tyranny. Examine the dead Woundkin for quest Gambler's Ruin. 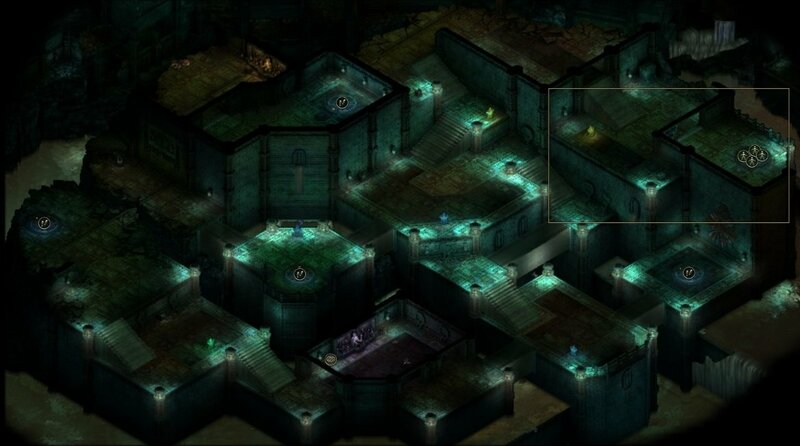 The other parts of this map are unlocked once you reached The Abyss. There are banes and sleepless wonder in this area, after you defeated them, jump across the breach and activate the crystal near the portal. This will lift a bridge to that platform. Defeat another group of Wagstaff's men and venturing forth. Use the Lazu Torchkey to unlock the passage to lower areas. Defeat two groups of banes and you can find the Cymo Torchkey from a dead body. Use the Cymo Torch key to unlock the upper area, after defeating some banes, you will meet a sleepless woman who's looking a way down. Get the Fractured Depth Keystone from her activate the portal nearby. Use the colors of the keys showing on the map. Some buttons are far away yet can be pressed. Some areas can only be accesed after you teleport there. How do you access the teleport just north of the center in order to get to that secluded area?